When I saw Digable Planets back in like 90-something at Apollo Theater, I was a little surprised to see that the crew was relaxed and humble. All three members were chilling with their public when the show was over, smoking blunts and walking in the street with the rest of the fans. I mean, these were MTV stars at this point. They could’ve been on some greater-than-thou stuff. Above, the former Seattle-to-BK transplant who went by Butterfly. He’s now back in Seattle catching some fame from the rap scene, but also keeping his efforts alive with his first full-length release that you can read about, here. 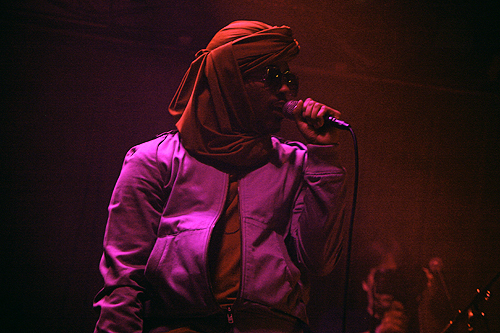 I’d been reading about “Shabazz Palaces” for a while, but didn’t know his first LP was coming out this summer. NPR has a nice little series, led by a former co-worker of mine, Ann Powers (who was nice enough to have coffee and a chat with me once in L.A.—she’s always been (kinda) supportive). This week, Sub Pop, the label that released Nirvana‘s first record and which is also home to Fleet Foxes, will release Black Up, the debut album from its first major hip-hop act, the critically adored Shabazz Palaces, which has resurrected the career of Ishmael Butler, once of the hit ’90s group Digable Planets. Every week a new hot act was bubbling up on my radar. I noticed that some of my old rocker friends were now frequenting hip-hop nights at Nectar and the Lo-Fi Lounge. Check the rest, here. And, here. And kudos to http://www.subpop.com/ for signing this guy. Smart move, ya’ll. ***Don’t forget to “Like” us on our FACEBOOK page.